Dolce, Dior, Oscar, oh my! A new fashion exhibit has come to town. But it wasn't organized by a museum... Greenhill senior Remy Fine coordinated the whole thing at Neiman Marcus in Downtown Dallas for her capstone project. The exhibit is a must-see. 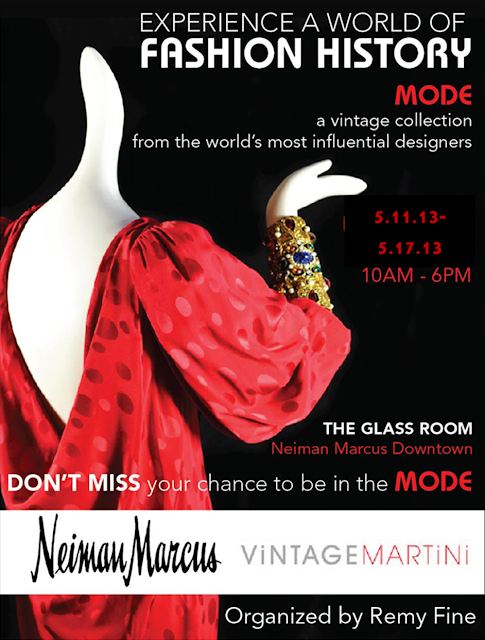 Every Dallas stylista will love Remy's exhibit. After talking to Remy and looking at all the designer vintage clothing, I chatted with her friend, fashion designer and Greenhill junior Mary Lo. Just like Remy, I can't wait to see what she does in the future. VINTAGE MARTiNi supplied the clothes for Remy's exhibit. Now it's your chance to Experience a World of Fashion History. Her project was such a success that Neiman Marcus extended the exhibit from one day to one week. Just one recommendation to her teacher: Remy deserves an A+!